Jamie Reyes wandered into a fight between warring super-human gangs and, in his frantic escape, came across the object at the source of their war: a strange blue scarab. The scarab wrapped Jamie with instant battle armor. Protected, he fled to safety. But after the escape, armor withdrawn into the scarab, Jamie discovered their bond was permanent. It was at this point that the scarab introduced itself as Khaji-da, a living tool of conquest created by The Reach, an alien empire bent on cosmic subjugation. Designed to control its wearer’s mind, Khaji-da and Jamie were meant to pave the way for Earth’s invasion. But the scarab was damaged, much to Jamie’s luck, and he retained free will. Now he struggles as Blue Beetle, misunderstood teenager and hero. 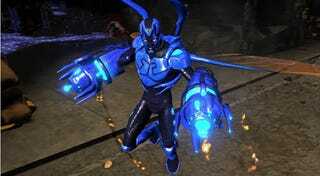 As Blue Beetle you have the mobility to seek and take-out enemy champions in the middle of Gotham Heights’ fog of war. Use Infiltrator Mode to track down and strike solo enemy targets, slowing them with Mandible Taser and leaping with Lethal Measures as they escape. If you find yourself in trouble, quickly change to Ranged form and use Stick and Move to get away, but remember that Infiltrator mode allows Blue Beetle to move faster. When enemies are standing on their own Control Point, poke at them in Ranged form. If they’re low on health, switch to Infiltrator and secure a kill by leaping with Lethal Measures. Try to finish them fast, before taking much damage from the turret. Contesting the Orbital Cannon is similar, stay in ranged form and maintain your distance while dealing damage as your frontline allies fight. If the enemy team gets to low health, you can switch to Infiltrator form and start taking them out fast. Previously: Nightmare Superman in Infinite Crisis.